Product code: VM922B Categories: Home Living, Kitchen Aids. Feeding Cup with a long mouthpiece and a removable lid with a larger drinking hole ideal for drinks as well as thicker, liquid foods. The feeding cup features graduated measures (in mm) on one side to monitor the amount contained and consumed. 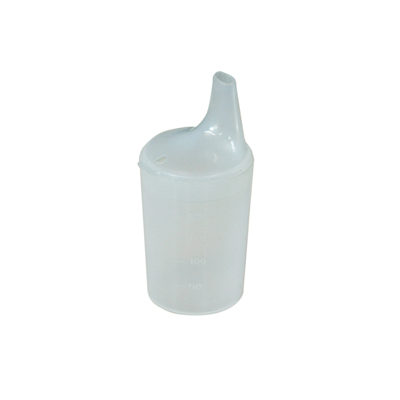 Feeding Cup with a long mouthpiece and a removable lid with a larger drinking hole ideal for drinks as well as thicker, liquid foods. The cup features graduated measures (in mm) on one side to monitor the amount contained and consumed. We’ve had great reviews about this product & how it has helped many people, which makes it one of our best sellers. If you would like to view more products like this one, please follow the link HERE. Below is a list of information regarding the Feeding Cup with Measures. The Aidapt two handled drinking mug is ideal for those who have a weakened grip or suffer from Parkinsons. Made from ceramic earthenware it is discreet and hard wearing. Dishwasher and microwave safe. Ideal for users with a weakened grip. The jar and bottle holder enables the user to open caps easily and is ideal for those with limited dexterity and weakness in the arm or hands. The jar and bottle holder can also be used single-handed. It is dishwasher safe and features a padded push bar for comfort and non-slip strips for ease of use. This convenient pair of Egg Cups from Aidapt have a suction cup on the base to keep the egg cups in place, making them an ideal personal aid/dining aid for one-handed users or those with limited mobility. Supplied in pairs. Larger, ergonomically contoured handles for a more comfortable and stable grip. The Steel Half Step is made in the UK at Aidapt's manufacturing plant in Wales. Constructed from high quality steel, with a coated frame, untreated treadplate and durable nylon feet, the Half Step is sturdy and recommended for outside use. This set of 2 grips has been designed to fit virtually any dining utensils, plus many other household items too such as pencils, pens, toothbrushes and more. The soft, silicone handle is large in size and textured to help enhance grip for the user. The Nose Cut-out Cup is a dining or kitchen aid that has been designed for customers who have difficulty tipping their head back; the cut out section fits around the nose, making drinking much easier and more comfortable. This easy-to-use kitchen aid has been cleverly designed to enable you to quickly open stubborn lids on a huge variety of jars and bottles with just one compact product. It is ideal for users with a weakened grip or limited dexterity. The jar and bottle openers are two separate products that are designed to fit a variety of sizes.